Neutralization of process water is a critical step in most industrial wastewater treatment processes. There are a multitude of regulatory requirements both Federal and State regarding wastewater discharge requirements. Users should consult their local agencies for specific requirements as they can vary by region. Any company that discharges effluent into sewer systems, lakes, streams are required to neutralize this effluent before allowing it to be discharged. Non-compliance could result in fines and other consequences. In many instances, recording the pH of the discharge is also required. In this system, effluent flows into the holding tank where a pH sensor (also known as pH electrode or pH probe) senses the pH of the solution. 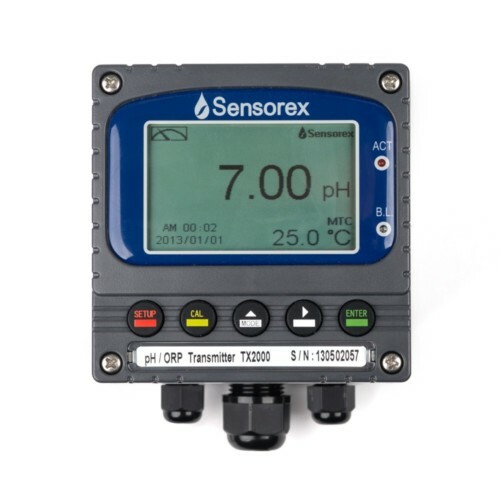 The sensor provides input to the pH controller device which operates chemical pump(s) to inject acid or caustic as required to neutralize the effluent. The mixer serves to evenly distribute the neutralizing chemicals throughout the holding tank to ensure complete neutralization. pH neutralization can be accomplished as a batch treatment or a continuous treatment. Whichever treatment mode is used, the more upfront data that can be gathered on the expected waste flow, temperatures, and waste stream constituents, the better the final system will operate. After neutralization has been completed, the effluent is discharged to waste while a second pH sensor senses the discharge effluent’s pH. The sensor inputs this information to a recording device which provides a record of the discharge for inspection or for future reference. Both cost of ownership and problem-free operation are important considerations when choosing a pH control system. Manufacturers of holding tanks, sensors, controllers, recorders, level and mixing devices are usually more than helpful in assisting with sizing and selecting equipment for specific needs. As with any purchase, don’t be afraid to ask questions of potential vendors to ensure that you are obtaining the best system for your application. Many operational problems encountered in a pH neutralization system are centered around the pH sensor, and chemical feed pumps. Incorrect choice of electrodes, holders, and placement are sources of common problems. Additionally, correctly sizing the chemical feed pumps is an important consideration. 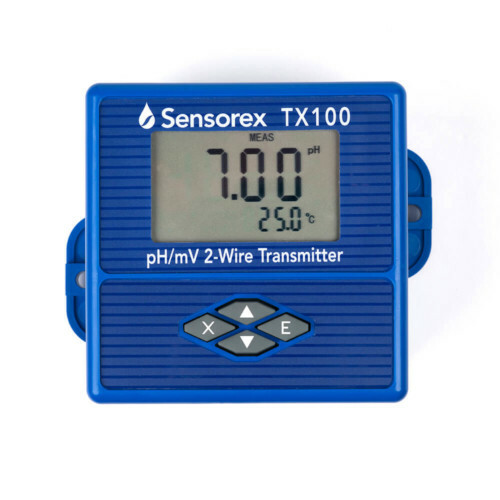 pH sensor selection is a key element in problem free operation. Sealed combination sensors are best for submersion in-tank applications. Double junction combination sensors will have a significantly longer lifetime than single junction sensors when measuring samples that contain heavy metals, sulfides, proteins, or other materials that interact with silver. Automatic temperature compensation (ATC) is not typically required since there is very little temperature error at pH values close to 7, though using ATC can make setup much easier. If you choose to use a pH sensor without ATC, you must complete the temperature circuit on the terminal of the instrument with a resistor. For example if your instrument is looking for a 100 ohm RTD, a 110 ohm resistor across those temperature terminal will fix the instrument to 25⁰C. Most wastewater pH neutralization systems are well suited for submersion sensors from the top of the tank. Use couplers and plastic pipe attached to the top of the pH sensor to keep the cable out of contact with the solution and chemicals. 1. Support the sensor and pipe so it does not move around in the tank and impact the tank wall or mixer. 2. Ensure the electrode is in moving turbulent flow to help minimize coating and leading to increased maintenance. 3. Make sure the electrode is not mounted at the chemical injection site. It takes a while for mixing to occur in a tank. 4. In applications with heavy coating, consider flat surface pH sensors. Also cartridge type quick disconnect types as they allow you to replace sensor and get back on line in seconds. You can take the sensors back and clean them later, recap and use again next time. Alternately, if the tank is large, an insertion assembly also known as a wet tap or hot tap in conjunction with a full port ball valve can be used so sensors can be mounted lower and removable while the tank is full should service be required. Also flat surface and cartridge types can also simplify the service requirements. Oily and solid coatings requiring frequent removal for cleaning: Use sensors with flat surface measurement areas. pH bulb breakage or premature failure as a result of abrasives or solid materials in the solution: Use sensors with flat surface measurement areas. Reference junction fouling or plugging requiring frequent removal for cleaning: Use quick-change cartridge style sensors or sensors with re-buildable reference designs. Reference side contamination as a result of interactions between the silver ions in the electrodes and materials in the solution which interact with silver. The result is short electrode life: Use double junction combination sensors. A mild 2% – 5% hydrochloric acid (HCl) solution will dissolve most coatings. Soak the sensor for 5 minutes then rinse with water. If necessary for heavy coatings, repeat and use cotton swap or chemwipes to clean the glass and junction areas. Remember never to use abrasive materials or brushes to clean pH sensors – this could damage the measuring surface. pH neutralization is a critical wastewater treatment process in many industrial manufacturing environments. Through proper design of the system and choice of sensor components, ongoing operation of the system can be optimized resulting in minimal maintenance and costs.